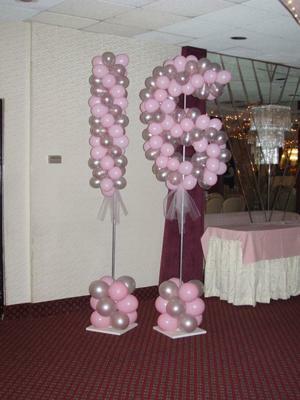 I would need the steps how to make the number 16 as part of two balloon columns. The picture shows what I mean. Regarding your comment about a video. 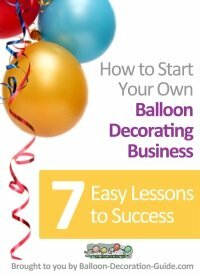 Please check out my answer to a similar question about making balloon numbers. You'll find a short video there with basic instructions. Scroll down to the bottom of the page. Is there anywhere I can find a video that shows me what you are saying. I am trying to follow but not seeming to get it. I did not realize I had to buy a rod for the 6. 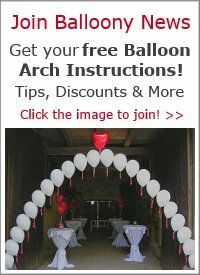 How to make a number 7 out of balloons? You can buy a base and pole from Conwin Online. 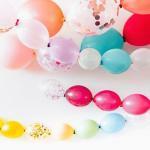 Take two different colors of 6 inch balloons, inflate two balloons of the same color and tie together loosely. Take the other color and do the same. Wrap the two sets together to make a quad and repeat this process for every row of balloons you need. Buy Aluminum rod and bend into 6 shape. The number one can be made from one column. 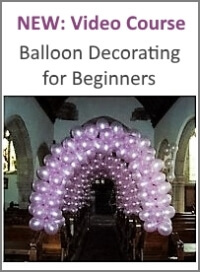 Take 5 inch balloons and undersize them to 4" and cover with quads. Secure to top of column with cut rubber bands tying from the bottom of the 6 to the first two layers of balloons on the column.